Dino-Mo is willing to help, but makes a few things clear to Enticia. First, being sorry and wanting to make things right isn't enough to earn Dino-Mo's forgiveness. Second, the advice Dino-Mo offers is for Bastion's benefit, not Enticia's. Third, Enticia will never live down that "turning into her mom" comment, especially when people know her mom's a hot bikini model. Shadowy Sentinel was intended to be the school psychologist for a long time. Does it make sense for her to be a school shrink AND a teacher? Probably not, but it's my comic world, and I'll build it the way I want to. So there. :-P Besides, it fits in well with her backstory; I envision the former villain as having sought psychiatric help while switching sides and serving time, which in turn led her to studying psychology. This gave her the unique expertise to teach studies into villains' minds, AND to help students at risk of turning evil. I added the "GLOOOOM" text in the last panel to show that it's just to emphasize her mood; I didn't want anyone to think she was using a dark version of her pheromone cloud powers. Don't forget, my birthday's next month! I've gotten some fan art already! If you want to send some my way, read the full rules on my site. 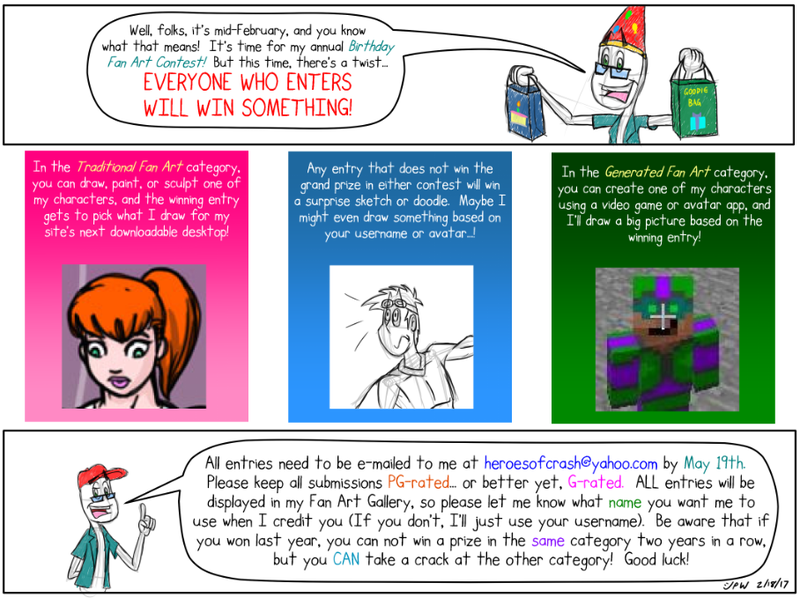 ALL valid entries will get some form of art in return!